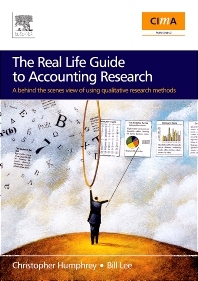 The Real Life Guide to Accounting Research is a book that goes behind the more official presentations and accounts of research methods to explore the lived experiences, joys and mistakes of a wide range of international researchers principally working in the fields of accounting and finance, but also in management, economics and other social sciences. The authors of the articles in this book address a wide range of issues and obstacles that they have confronted at various stages in their respective research careers. In reflecting on their personal experiences, they provide practical guidance on how to overcome the types of problems that typically confront researchers in their day-to-day work. Masters students, doctoral students, researchers and financial analysts in the field of accounting and finance, with in an interest in qualitative research methods. Long: Introduction. (C. Humphrey, B. Lee). Section One. The Meaning of Research. The Search for Clues in Accounting History. (S.P. Walker). Adventures in Social and Environmental Accounting and Auditing Research: A Personal Reflection. (D. Owen). Using Case Studies in Finance Research. (G. Stoner, J. Holland). Accounting and Auditing Research in the United States. (T.A. Lee). Forever Destined to be Extras in a Broadway Show? A Discussion on the Status of National Accounting Research in an International Arena. (M.A. García-Benau, J.A. Laínez-Gadea). "Nice Work": Writing a Ph.D. Thesis in Accounting. (A. Loft). Learning to Balance: The Experience of an Overseas PhD student in the UK. (Naoko Komori). Section Two. Managing the Research Process. Starting and Managing a European Union Funded Research Project. (F. Birkin). Management of a Research Team. (J. Broadbent, R. Laughlin). Confessions of a Research Assistant. (J. Burns). Making Sense of Interactions in an Investigation of Organisational Practices and Processes. (I. Lapsley). Qualitative Research on Accounting: Some Thoughts on What Occurs Behind The Scene. (J. Bédard, Y. Gendron). Critical Independence. (B. McSweeney). Section Three. Collecting and Analysing Data.. Case-Based Research in Accounting. (A.J. Berry, D.T. Otley). Doing Case Study Research. (R.W. Scapens). What is the Object of Accounting? A Dialogue. (Masaya Fujita, Yoshiaki Jinnai). Refining Research Questions in the Course of Negotiating Access for Fieldwork. (T. Ahrens). Insights from Internet-Based Research: Realising a Qualitative Understanding from a Quantitative Search Process. (A. Sangster, D.E. Tyrrall). The Case Study, The Interview and the Issues: A Personal Reflection. (D.E.W. Marginson). Qualitative Research: Experiences in Using Semi-Structured Interviews. (J. Horton, R. Macve, G. Struyven). To Tape or Not to Tape: Reflections on Methods of Data Collection. (T. Hayes, R. Mattimoe). Using Computer Assisted Qualitative Data Analysis Software: Respecting Voices Within Data Management And Analysis. (F. Anderson-Gough). Qualitative Data Analysis: Illuminating a Process for Transforming a "Messy" but"Attractive""Nuisance". (B. O'Dwyer). Section Four. Publishing And Dissemination. Requirements and Understandings for Publishing Academic Research: An Insider View. (J. Guthrie, L.D. Parker, R. Gray). How Do Accounting Research Journals Function? Reflections from the Inside. (K. Lukka). Research and Public Practice Accounting. (S. Turley). Disseminating Research Through Teaching. (S. Richardson, J. Cullen). Section Five. Interdisciplinary Perspectives. Qualitative Methodology in Practice: My Experience. (H. Collins). Raising the Profile of Qualitative Methods in Organizational Research. (C. Cassell, G. Symon). Qualitative Dimensions in Finance and Risk Management Research. (K. Dowd). Author Index. Subject Index.